Tonight is Vegetarian Night (sorry, ‘’Meat Reduced Night”). Or, it was supposed to be. With heavily-sighed reluctance, my boyfriend recently agreed to eat two meat-free meals per week, so we can eat the same main dish together sometimes. I use ‘’meat reduced’’ rather than ‘’vegetarian’’ as a bit of a head-fake term. Not that it fools him much. I had it all planned out – stuffed Butternut Squash, roast veg and a mushroom sauce on the side. Usually, if he doesn’t get too involved in the preparation (cue locked kitchen door and refusal to answer any statement starting with ‘What is that…?’ or ‘’Are you going to do it like that?”), then he’ll give most things a try. Then came the proverbial spanner. “I’ll be home soon – I finished an hour early,’’ came his unexpected call. I was pretty ravenous already and knew he would be too. Unless I came up with something quickly, I could see myself being persuaded to order a pizza. I lunged for Household Management and began panic-scanning the soup recipes. INGREDIENTS – 4 lbs. 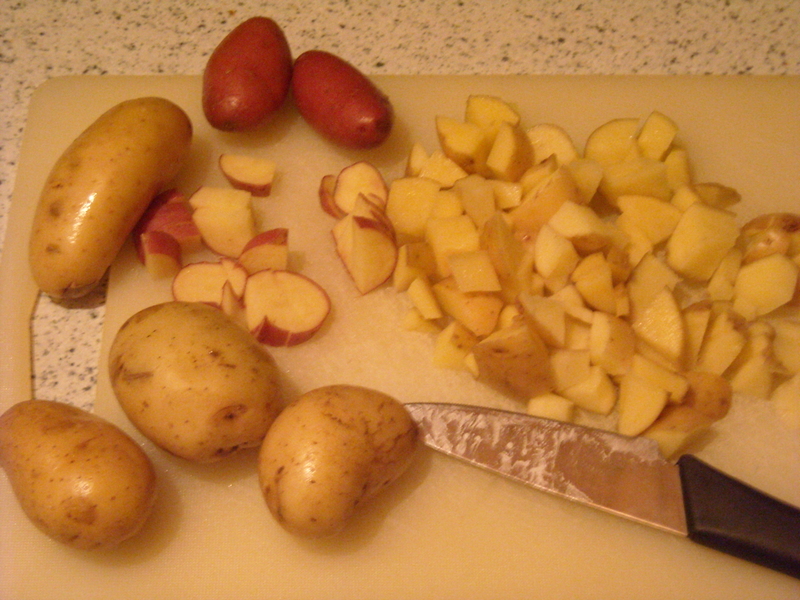 of mealy potatoes, boiled or steamed very dry, pepper and salt to taste, 2 quarts of stock (from recipe no. 105). Luckily I’d sent him on a detour to the local building centre to buy a new kitchen tap and to check out some shelves, gaining me some valuable minutes to get the soup on and rescue Meat Reduced Night. Naturally, that ol’ spanner hadn’t yet finished clunking round the works. B: “€15 or €17…?” he pressed. Hang up the phone. Push cat off bench. Attempt to fill saucepan with water. Forget tap is broken. Water sprays out, drenching my face and top. Cue swearing. Phone rings. 2 minutes later, I got him off the topics of shelf pros and cons and off the phone. Hasten to finish soup and get the main course on. Shove cat off bench again. Open cupboard to get something. Half the contents crash out. Cue more swearing. Forget tap is broken. Again. Water sprays out, drenching my face and top. Again. Cue swearing. Again. Just as his keys were inserted into the key hole, the soup was miraculously done. 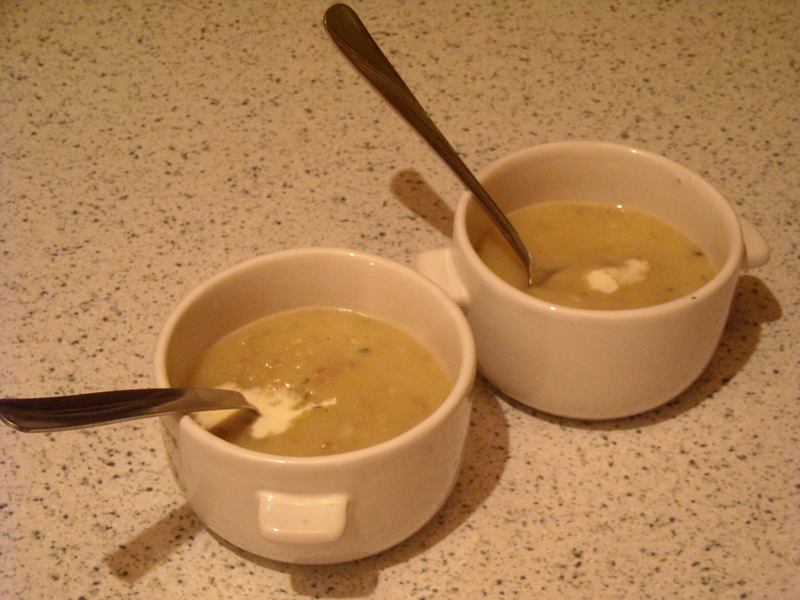 We enjoyed the soup. Simple and (barring distractions) super quick. I added some oregano and a dash of cream to finish it off before serving. As for my boyfriend’s reaction to the main dish, well, you probably don’t want to know. This entry was posted on December 16, 2009 at 9:25 pm and is filed under food. You can follow any responses to this entry through the RSS 2.0 feed. You can leave a response, or trackback from your own site. Man it’s got to be a bit frustrating that your bf isn’t too incredibly open to veg dishes! My bf is omni and I peacably leave him that way, but he understands that when we eat at my house, he’ll be eating veg, and he honestly is so open to trying almost anything. He’s even admitted to me that some of his new favorite dishes are veg recipes I’ve made for him. It’s already nerve-wracking for me to try out new recipes, I can’t imagine what it must be like to try them out knowing he’ll be coming at them with a “yuck, but they’re veg” grudge.